Location was excellent for exploring the old town and easy to reach other places. Apartment was clean with everything needed. Hosts were fabulous. We particularly liked the terrace...and the shower! The apartment was in a fantastic location in the old town. The apartment was spacious and had all the facilities we needed. Good shower and view from balcony. Markos was very helpful at check in and the guide book in the apartment was a help throughout our stay. The owners are amazing - very friendly and helpful and made the start of our visit very good. The location was fantastic and the flat was generally very spacious. You are right in the heart of the old town and there are dozens of bars, restaurants, shops and a supermarket within a minutes walk. The harbours and beaches are also easily walkable. The bathroom was a bit on the small side, but it does have an excellent shower. There were plenty of towels and great to have washing up liquid, soap powder etc provided. The beds were very comfy and the air con very efficient. The roof top space is brilliant, but see negatives for more comments. The owners were really helpful, met us and greeted and organised taxis, so making it all the easier - thanks! The big bedrooms, good sized kitchen. All very clean and well-decorated. Roof terrace with table and chairs - great view. Good location for exploring the Old Town as it was right in the centre of it. 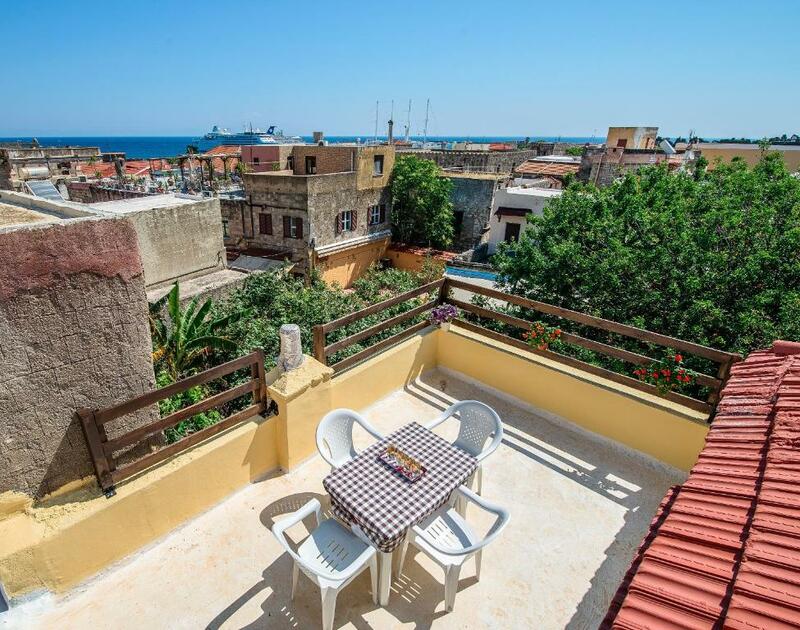 The apartment is in a fantastic location to explore Rhodes old town with great shops, bars and restaurants right on your door step. The apartment was big enough for 4 adults and a toddler and they were kind enough to set up a bed for our daughter. 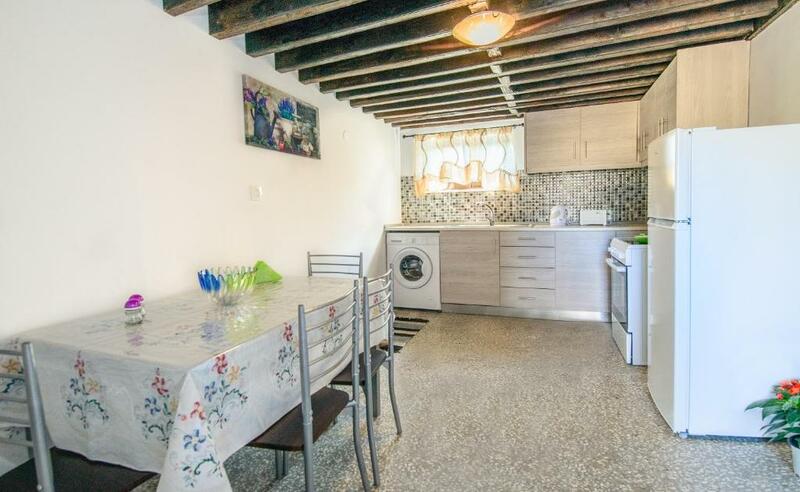 Location perfect, very.central in the Old Town so easy walking distance to historical sites and harbour and numerous restaurants within very close proximity. 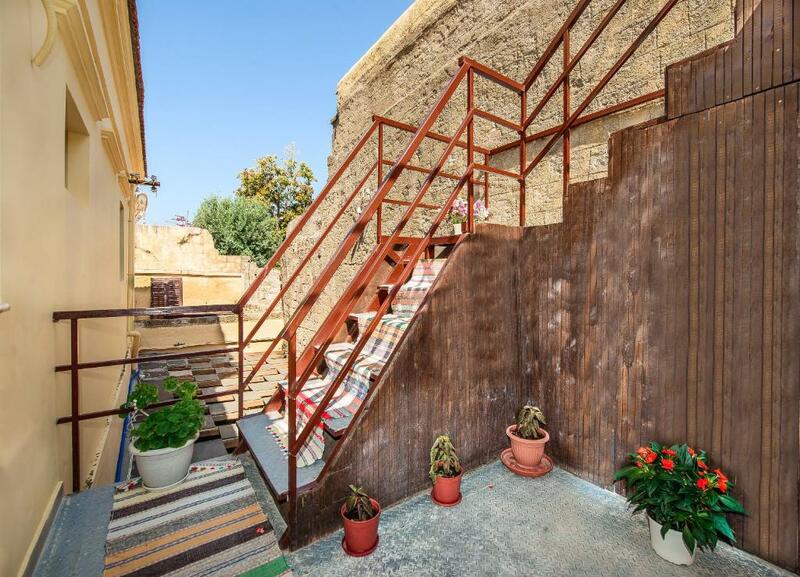 Very spacious apartment, with a rooftop terrace. Excellent location in Rhodes Old Town with a super bar and a number of tavernas literally just round the corner. And an superb bakery just around a couple of corners - open 24 hours a day and so friendly ( we did suggest they might like to open a branch in the town where we live in England but for some reason they declined.....) Roof terrace with a view over the Old Town with the harbour in the background - breakfast in the morning was spent watching the ferries arriving and the swallows circling around - very restful. Very friendly welcome - they organised a taxi to meet us at the airport and someone was waiting to take us to the apartment and give us the keys despite the fact it was after 10.00pm. We can't wait to go back again. Easy to communicate with hosts who arranged a taxi to meet us at airport and then met us at gate to old town as no cars permitted. Best not to bring too much luggage but the location right in the old town is wonderful and the hosts couldn't be nicer. Air con, roof terrace and washing machine was very welcome. Bathroom and lounge are small but bedrooms are very spacious. We only stayed one night but it was very good. Lock in a great price for Kathy's Apartment – rated 8.3 by recent guests! One of our best sellers in Rhodes! 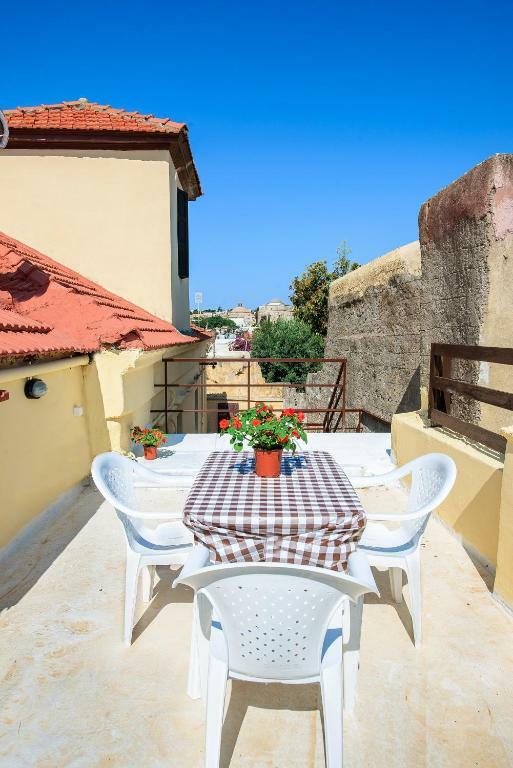 Located in the Rhodes Medieval city district in Rhodes Town, this air-conditioned apartment is 1,300 feet from Clock Tower. 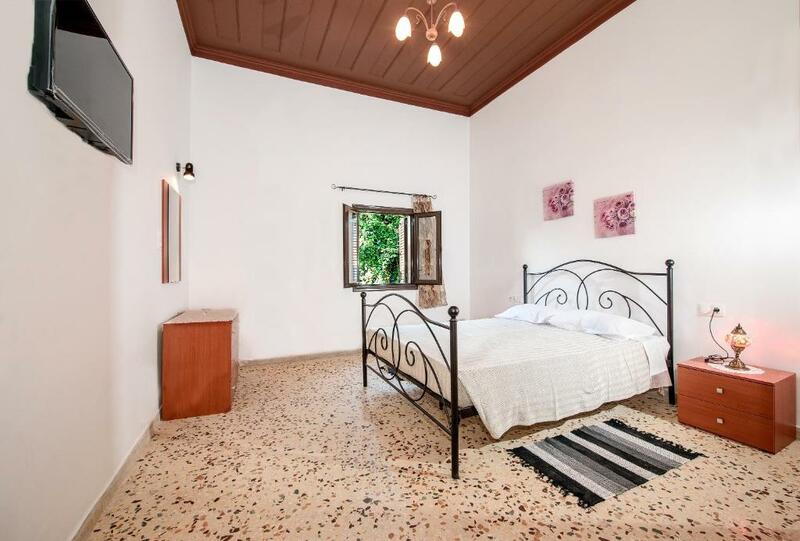 The property features views of the city and free WiFi is featured throughout the property. The unit is fitted with a kitchen. A flat-screen TV is offered. Other facilities at Kathy's Apartment include a sun terrace. The nearest airport is Rhodes International Airport, 9.8 mi from the property. 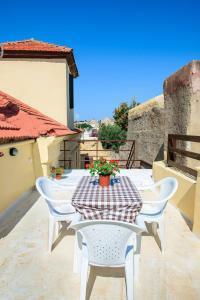 뀐 Located in the real heart of Rhodes, this property has an excellent location score of 9.7! When would you like to stay at Kathy's Apartment? This apartment has a kitchenware, washing machine and toaster. 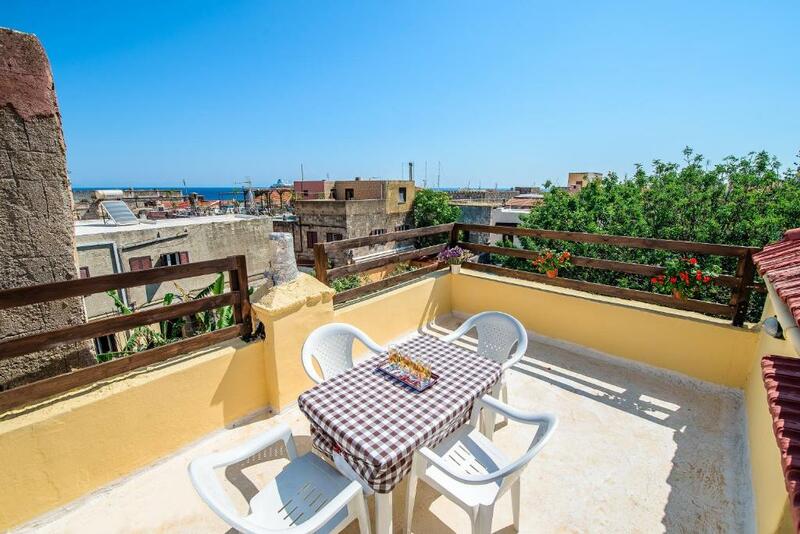 Kathy’s Apartment is located in the heart of the Old Town, less than 3 minutes walk from the famous Ipokratous square, and 10 minutes’ walk from Rhodes Town. The apartment accommodates up to 4 people, and it has an amazing terrace overlooking the medieval walls of the old town . Kathy’s apartment is located on the first floor, it has 2 bedrooms: The first one with a double bed, and the second one with twin beds. Both bedrooms have their own TV and wardrobe. The kitchen is fully equipped, and it includes: washing machine, stove with oven, fridge and all the necessary tools in order for you to prepare and enjoy your meals. The bathroom is got a shower with hydro massage and it is newly renovated. Wi-Fi access are some of the services we offer. House Rules Kathy's Apartment takes special requests – add in the next step! Please inform Kathy's Apartment of your expected arrival time in advance. You can use the Special Requests box when booking, or contact the property directly using the contact details in your confirmation. Although the roof space was great, it could be so much better if it had better quality furniture. This was not of adequate quality, especially as there is no sitting space as such in the main flat. Two of the chairs were broken and I had to keep fixing the umbrella as it was damaged and couldn’t stand up to the breeze. The kitchen was a good size, but wasn’t really well equipped enough to prepare a proper meal. Ok if you are planning to eat out all the time, but one pan and one frying pan, no mixing/salad bowls is not enough. The shared outer door to the property really needs sorting out, it’s hanging off it’s hinges and is a pain to open and close. The flat needs a safe. Loud music until 5am , take some earplugs. 2 keys would have been helpful too with different people coming and going separately. No light on the stairs/landing area, so pitch black when coming in at night - luckily we always take a small torch on holidays! There's two nightclubs nearby, at least one of them open until 6am. Not too loud, but a constant background noise in the apartment. Furnishings very basic, not luxurious but adequate. Squeaky bed needs repair. Mattress was not of a good quality we both suffered bad backs which I never do in a strange bed. Communal door was almost off its hinge and difficult and quite dangerous when opening. Door handle to rooftop terrace needs repair. Only one casserole dish to cook in. No other saucepans. No wine glasses. Lack of decent kitchen untensils. Whilst there is a good size roof terrace the view is unspectacular. The downside of being so central is the noise travelling at night, but easy to shut windows and turn on air conditioning if you're a sensitive sleeper. Location, terrace, helpful and friendly service. Uncomfortable bed and broken umbrella on balcony.